Copyright: © 2017 Matata BM, et al. This is an open access article distributed under the Creative Commons Attribution License, which permits unrestricted use, distribution, and reproduction in any medium, provided the original work is properly cited. Objectives: The role of perioperative hemofiltration (HF) in adult patients with impaired renal function undergoing cardiac surgery is controversial. There are suggestions that it may be beneficial for high risk patients undergoing prolonged cardiopulmonary bypass (CPB) surgery. However, long term outcomes in coronary artery bypass graft (CABG) surgery patients have not been investigated. Methods: To address this we retrospectively followed 7620 patients who underwent CABG between April 2001 and March 2006. Logistic regression was used to risk adjust in-hospital outcomes. Cox proportional hazards analysis was used to risk adjust Kaplan-Meier freedom from death curves. Outcomes were adjusted for American Heart Association and American College of College of Cardiology recommended variables. Results: 113 patients had intraoperative HF, 38 had postoperative HF and control group of 7006 that had no HF. After adjusting for differences in case-mix, patients with preoperative kidney disease who received postoperative HF proportionately had significantly higher rates of hospital deaths as compared with intraoperative HF patients. In addition, 5-year follow-up risk-adjusted freedom from death indicated significant differences between intraoperative HF group and postoperative HF patients. Conclusions: These findings support the hypothesis that after adjusting for differences in case mixes, the use of intraoperative hemofiltration may offer superior short term clinical outcomes and longer-term survival benefits for patients with preoperative kidney disease. Cardiopulmonary bypass is known to adversely impact upon perioperative renal function in particular for individuals with diabetes mellitus or an existing renal impairment . Renal injury may occur resulting in acute kidney injury (AKI) which is the standard term for an abrupt and sustained decrease in renal function resulting in the retention of nitrogenous (urea and creatinine) and non-nitrogenous waste products. Depending on the severity and duration of the renal dysfunction, this accumulation is accompanied by metabolic disturbances, such as metabolic acidosis and hyperkalaemia, changes in body fluid balance, and effects on many other organ systems. Definitions of AKI have varied from the severe (i.e., that require dialysis) to the slight increases in serum creatinine concentration by 44·2 μmol/L . Severe AKI, defined as renal failure that requires renal replacement therapy is a major complication of cardiac surgery with an associated mortality of 60-100% when treated with standard hemodialysis . More recently, continuous renal replacement techniques have been introduced, which circumvent the hemodialysis instability associated with intermittent hemodialysis and its limited ability to control the patient’s volume state . One such form of continuous renal replacement therapy is continuous venovenous hemodialysis (CVVH) that has been shown to substantially facilitate improved care of patients with severe AKI after cardiac operations when used early and intensively . Hemofiltration was introduced in the 1980s for CPB management [6-9], and has been shown in pediatric cardiac surgery to be effective at regulating hemostasis, removal of cytokines and complement components . Similarly, in adults zero-balance hemofiltration was shown to be effective at removing inflammatory mediators during CPB [10,11]. In addition, one recen.t prospective, randomized double-blind trial demonstrated that hemofiltration but not steroids results in earlier tracheal extubation following CPB . Initially hemofiltration was intended to correct the accumulation of extravascular water during or immediately following the surgical procedure. Several new benefits have been identified, such as the reduction of postoperative blood loss and immediate improvement in hemodynamic [13,14]. In addition, recent evidence has shown that mild renal dysfunction is a predictor of outcomes in terms of in-hospital mortality, morbidity, and midterm survival in patients undergoing coronary artery bypass graft” (CABG) surgery . Since hemofiltration is well tolerated in patients with compromised circulatory status this technique has become useful in the postoperative period for treating patients with acute renal failure. Indeed, early and aggressive continuous venovenous hemofiltration (CVVH) has been associated with better than predicted survival in severe postoperative AKI . However it is still unknown as to whether real-world outcomes of cardiac operations incorporating intraoperative hemofiltration as applied during cardiopulmonary bypass surgery are markedly different from those with postoperative hemofiltration initiated in intensive care units or wards. The objective of this study was to analyse real-world data to assess whether outcomes differ for patients with preoperative kidney disease treated with hemofiltration modalities either during CPB or 1-2 days after coronary artery bypass graft (CABG)” to “CABG. We retrospectively followed 7620 patients who underwent on-pump first-time isolated cardiac bypass graft surgery between April 2001 and March 2006. All data were collected (Table 1) during in-patient admission as part of the routine clinical practice as previously described . In-hospital mortality was defined as deaths within the same hospital admission regardless of cause or within 30 days of hospital discharge. Postoperative stroke was defined as a new focal neurological deficit and comatose states’ occurring postoperatively that persisted for 24 hours after its onset and was noted before discharge. Transient confused states and temporary intellectual impairment were not included. Postoperative myocardial infarction was defined as unequivocal ECG changes, elevation of cardiac enzyme(s) to 3 times upper limit of creatinine kinase (CKMB) and above twice the upper limit of normal or elevated troponin (T/I), and chest pain typical of ischemia lasting for more than 20 minutes. The European Risk Stratification Score System (EuroSCORE) was used to assess risk associated with cardiac surgery . Patients with renal dysfunction were described as those with an estimated glomerular filtration rate (eGFR) <60 mL/minute/1.73 m2 that has persisted for at least 3 months before the date of surgery. We stratified patients into 3 groups: (1) patients treated with intraoperative hemofiltration (n=112) during cardiopulmonary bypass; (2) patients treated with postoperative hemofiltration (n=38); (3) a control group without hemofiltration use (n=7006). Patients with preoperative dialysis dependent renal insufficiency were excluded from further analysis. Intraoperative hemofiltration was applied for either secondary renal impairment or correction of fluid retention due to cardiac failure/excessive hemodilution. Standard intraoperative hemofiltration involves connecting a parallel circuit to the cardiopulmonary bypass via hollow fibre filters (Polysulfone PS, Hospal Lyon, France). Blood flow rates were maintained at 300-500 ml/min (about 10% of the pump output) with a transmembrane pressure of about 300 mm Hg. Cases of severe AKI were identified postoperatively and treated with continuous venovenous hemofiltration (CVVH). AKI was as previously defined by the KIDGO consensus conference [19,20]. The technique of CVVH involved a double lumen catheter connected to a blood pump, through which blood was pumped into a module at flow rates of 200 to 250 mL/m with an intravenous pump controlling the ultrafiltration rate at 2 L/h. The module was also equipped with pressure alarms and an air bubble trap. Standard Polysulfone PS filters were used in all patients. Anticoagulation of the circuit was performed in accordance with local clinical practice governed by duration of hemofiltration. Replacement fluids were administered at the pre-filter stage with rates chosen to suit the desired fluid therapy goals. The patients were followed up through a national tracing service using patient’s name, National Health Service unique number and date of birth, gender, and postcode. The primary endpoint was the risk-adjusted freedom from death within the 5-year study period. Secondary outcomes include risk-adjusted in-hospital death, atrial fibrillation, myocardial infarction, stroke, re-operation for bleeding, and surgical wound infections. Due to non-normality of data, continuous variables are shown as median with 25th and 75th percentiles. Categorical variables are shown as a percentage. Comparisons were made with Kruskal-Wallis tests and Chi-square tests as appropriate. Logistic regression was used to risk adjust in-hospital outcomes for differences in patient and disease characteristics . Deaths occurring as a function of time were described using the product limit methodology of Kaplan and Meier . Cox proportional hazards analysis was used to calculate adjusted hazard ratios (HR) and to risk adjust the Kaplan-Meier survival curves . Logistic EuroSCORE  was used for risk adjustment. This approach aims to balance out patient preoperative characteristics by incorporating a commonly used cardiac surgery risk scoring method. In all cases a p value <0.05 was considered significant. All statistical analysis was performed with SAS for Windows Version 8.2. A total of 113 patients had intraoperative HF, 38 had postoperative HF and 7006 had no HF. Tables 1 and 2, shows patient’s preoperative characteristics and in-hospital outcomes. In the unmatched data (Table 2), we observed increased in-hospital death, and re-operation for bleeding outcomes in both the HF groups as compared to the control group without HF. More volume was removed from the postoperative haemofiltration group (Table 2). Interestingly, all the patients in the postoperative HF group had preoperative renal impairment and that 97% of these patients went on to developed acute kidney injury that necessitated hemofiltration in intensive care unit. Table 1: Unadjusted patient characteristics. Table 2: Unadjusted in-hospital outcomes. In contrast, 38% of the patients on intraoperative hemofiltration had preoperative renal impairment and 27% developed perioperative acute kidney injury. As shown on table 3, only 39.5% of patients with preoperative renal dysfunction that undergone intraoperative HF had AKI compared with 33.5% of those in the group that had no preoperative kidney impairment. This compares favourable with patients that had the conventional delayed postoperative CVVH where all patients who had preoperative kidney disease suffered AKI except one. Table 3: Incidences of preoperative renal dysfunction and corresponding AKI rates. The adjusted odds ratios (OR) for in hospital outcomes (Table 4) indicated that in both intraoperative and postoperative HF groups there was no association between the use of HF with in hospital strokes, re-operation for bleeding, myocardial infarction and surgical wound infections. In contrast, a strong association was shown with in-hospital death for intraoperative HF (OR 2.8, CI 1.5-5.1, P<0.001) and more so in the postoperative HF group (OR 12.1, CI 5.7-25.6, P<0.001). Atrial fibrillation was also significantly associated with postoperative HF group but not the intraoperative HF group. Table 4: Crude and adjusted odds ratio for in-hospital outcomes. Freedom from death curves are shown in figure 1. 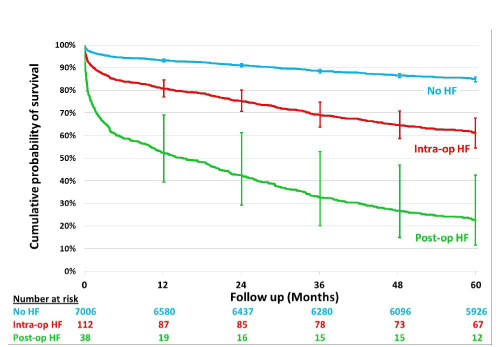 After adjusting for differences in a number of confounding factors (Figure 2), there was a significantly higher mortality during the follow-up period for the postoperative HF patients as compared with the intraoperative HF group. Figure 1: Risk unadjusted freedom from death. Figure 2: Risk adjusted freedom from death. The application of hemofiltration before and after CABG surgery is very common for a number of indications including fluid overload and preoperative kidney impairment. Studies  have shown that up to 10% of patients sustain renal dysfunction due to kidney injury induced by CPB during CABG surgery [25,26]. Karkouti et al. , also demonstrated that CPB was associated with a 33.6% prevalence of postoperative acute kidney injury (AKI), which was associated independently with a greater than 4-fold increase in the odds of death. The findings are consistent with our observations of 6.4% postoperative AKI rates for patients with no history of preoperative kidney disease and that these rates increase significantly (3.5-15 fold) for patients with a history of preoperative kidney disease irrespective of the type of renal replacement intervention used. These findings are in agreement with previous studies  that also demonstrated that preoperative mild kidney disease was highly predictive of both AKI and in-hospital deaths . Mechanisms related to the occurrence of AKI in these patients is however still uncertain. Several studies [28-30] have previously demonstrated that renal injury sustained during cardiac surgery may be mechanistically related to pre-existing renal dysfunction, diabetes mellitus, ventricular dysfunction, older age, hypertension, microembolic and macroembolic processes, inflammatory mediators, prolonged CPB time, sensitivity to sympathetic stimulation, and perturbation in renovascular resistance and flow. Indeed findings from our study suggest that when data are corrected for pre-existing renal dysfunction, diabetes mellitus, ventricular dysfunction, older age, hypertension, the risk of AKI is significantly reduced for patients on intraoperative HF, suggesting that multiple comorbidities contribute to incidents of AKI. Interestingly, the incidents of AKI in patients with preoperative kidney injury were comparable to those without when intraoperative HF is given. This may suggest that intraoperative HF may protect patients from CPB-induced injury. Other authors  have also demonstrated that the occurrence of postoperative mild to moderate acute kidney injury (AKI) was associated with a mortality rate of 10% to 20%, findings that are consistent with results from our study. Interestingly, AKI incidents in this study were associated with even much higher in-hospital mortality rates (50%) despite the application of postoperative CVVH. When the results are corrected for preoperative chronic kidney disease and other risk factors, the evidence also suggests that preoperative kidney disease is the single most significant risk factor for in-hospital mortality irrespective of renal support treatment modalities. Currently, there is a lack of consensus on indications for and timing of initiation of renal support for patients with preexisting renal impairment or those at risk of AKI in the perioperative period. Some studies have shown that postoperative HF improves outcomes if initiated early [32-36]. In contrast, others such as Bouman and co-workers in 2003  studied the effects of the initiation time of continuous venovenous hemofiltration on patients with circulatory and respiratory insufficiency leading to oliguric AKI. The authors observed that recovery of renal function was not improved by using high ultrafiltrate volumes or by early initiation of hemofiltration. 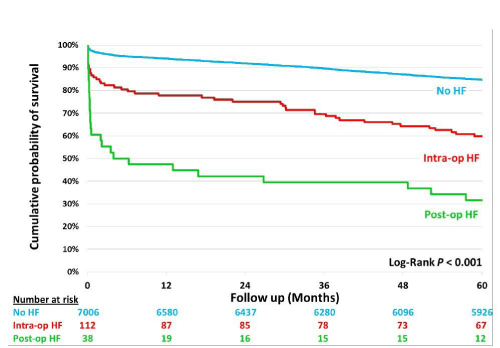 In addition, other randomised studies failed to demonstrate that intensity/duration of renal replacement therapy could improve outcomes [38,39]. Issues remain regarding the proper definition of AKI [19,20]. While there is an unanimous agreement that renal complication severely impact patient outcome, specific aspects of management, including the method of renal replacement therapy, i.e. dialysis based on the diffusion principle or hemofiltration (based on convection); the dose of renal replacement therapy (Urea KT/V for dialysis vs. hemofiltration flow (ml/kg/hour)), and the timing (early vs. late) of renal replacement therapy are all controversial. Even after a consensus definition was put forward [the R.I.F.L.E classification: 2nd Consensus Conference, ADQI Group [40-42], there is still great uncertainty as what is the best course of action when treatment decisions have to be made specifically aimed at patients with pre-existing renal impairment. Existing evidence would suggest that even slightly elevated serum creatinine predicts AKI requiring hemofiltration after cardiac surgery . Despite the limitations, our study is the first to show that in high risk category of patients with pre-existing renal impairment, hemofiltration during cardiopulmonary bypass can minimise incidences of postoperative AKI or has survival benefits. Based on the observation from our study that patients with high preoperative risk scores (EuroSCORE >16.1) are at increased risk of further renal impairment we hypothesize that it is these types of patients who could derive significant benefits from intraoperative hemofiltration. Indeed our most recent randomised controlled trial on intraoperative hemofiltration during cardiac surgery for patients with preoperative chronic kidney disease demonstrated superior outcomes as compared with treatment as usual. This is in terms of significant reduction in rates of pulmonary infections and in-hospital deaths compared with a control usual care group without the use of intraoperative hemofiltration . The randomised trial  appear to support the findings from this real-world study setting that after adjusting for case mixes intraoperative hemofiltration is associated with more favourable short term outcomes such as in-hospital death and reduced risk of atrial fibrillation as compared with equivalent patients that received the traditional delayed postoperative hemofiltration care. The underlying mechanisms for these benefits have yet to be elucidated. It is possible that the benefits of intraoperative hemofiltration (conventional or modified ultrafiltration) can be explained by the elimination of inflammatory mediators during the metabolic stressful period of coronary bypass, as demonstrated in studies before [6-10]. In addition, there is also evidence to suggest that intraoperative hemofiltration reduces levels of S100b release and cognitive dysfunction , resulting in an earlier tracheal extubation following cardiopulmonary bypass . In other studies it has also been shown that intraoperative hemofiltration may reduce the requirement for post-operative blood transfusion, also increase BP and cardiac index immediately after hemofiltration . In conclusion, findings from this study support the hypothesis that the use of intraoperative hemofiltration may offer short term clinical benefits and improve longer-term survival for patients with preoperative kidney disease. In contrast, the delayed use of postoperative hemofiltration on patients with known preoperative kidney impairment does not significantly impact occurrence of AKI and the impact of AKI on survival. It is with this reasoning and evidence from other studies [46-48] that we hypothesize that for patients with preoperative kidney disease routine application of intraoperative haemofiltration or early CVVH rather than the traditional delayed CVVH (which is commonly started 1-3 days after CABG in response to mostly oliguria symptoms and electrolytes imbalance) may improve outcomes of these vulnerable patients. The recent introduction of hemodialfiltration techniques incorporating citrate-based regional anticoagulation systems soon after CPB may be a game changer for patients with preoperative kidney disease in routine clinical practice . Although our study included a large sample of patients undergoing coronary artery bypass surgery, it was not a prospective randomised trial, and therefore had a number of limitations. For example, patients who received HF on bypass were likely to have had less severe renal impairment and a lower EuroSCORE, and therefore this might impact upon the results giving the Intra-Op HF Group a better outcome because they were going to do well regardless. Our study, however, considered three unselected study groups of patients on the basis of use and timing of hemofiltration and therefore provides an insight into real practice. In addition, the follow-up data obtained via the National Institute of Statistics only provided us with knowledge of the survival status without the cause of death or differentiation between cardiovascular or other cause of death. We also do not have data on the underlying pathophysiology of renal dysfunction in the patients included in the study. The findings however suggest that a well-designed randomised study would offer a better evaluation of the treatment strategies for this group of patients. Lange HW, Aeppli DM, Brown DC. Survival of patients with acute renal failure requiring dialysis after open-heart surgery: early prognostic indicators. Am Heart J. 1987; 113: 1138-1143. Hosmer D, Lemeshow S. Applied logistic regression. New York, NY: John Wiley & Sons Inc; 1989.